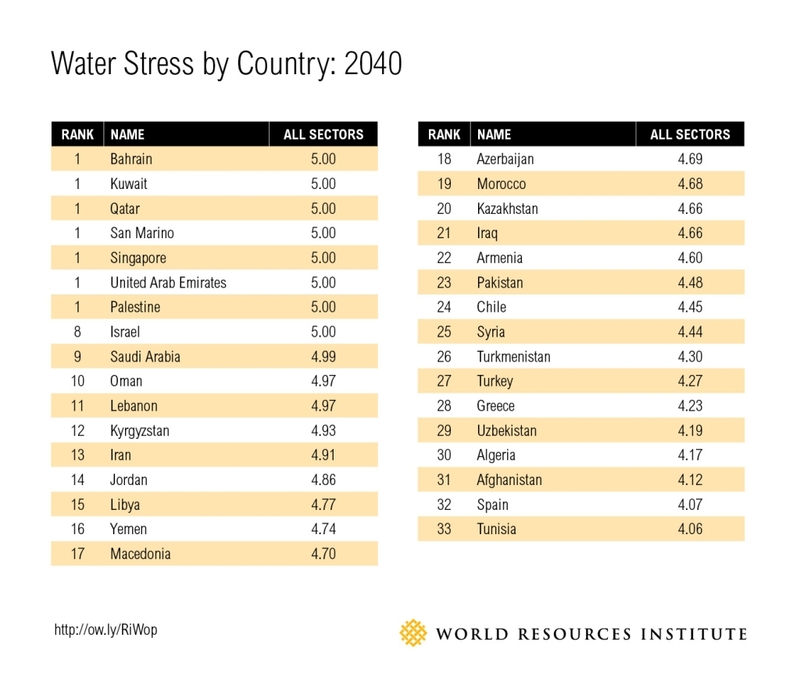 14 of the 33 countries most likely to be water-stressed in 2040 are in the Middle East. (Dubai, UAE) Photo by Jason Mrachina/Flickr. The world’s demand for water is likely to surge in the next few decades. Rapidly growing populations will drive increased consumption by people, farms and companies. More people will move to cities, further straining supplies. An emerging middle class could clamor for more water-intensive food production and electricity generation. But it’s not clear where all that water will come from. Climate change is expected to make some areas drier and others wetter. As precipitation extremes increase in some regions, affected communities face greater threats from droughts and floods. While changing water supply and demand is inevitable, exactly what that change will look like around the world is far from certain. A first-of-its-kind analysis by WRI sheds new light on the issue. Fourteen of the 33 likely most water stressed countries in 2040 are in the Middle East, including nine considered extremely highly stressed with a score of 5.0 out of 5.0: Bahrain, Kuwait, Palestine, Qatar, United Arab Emirates, Israel, Saudi Arabia, Oman and Lebanon. The region, already arguably the least water-secure in the world, draws heavily upon groundwater and desalinated sea water, and faces exceptional water-related challenges for the foreseeable future. With regional violence and political turmoil commanding global attention, water may seem tangential. However, drought and water shortages in Syria likely contributed to the unrest that stoked the country’s 2011 civil war. Dwindling water resources and chronic mismanagement forced 1.5 million people, primarily farmers and herders, to lose their livelihoods and leave their land, move to urban areas, and magnify Syria’s general destabilization. The problem extends to other countries. Water is a significant dimension of the decades-old conflict between Palestine and Israel. Saudi Arabia’s government said its people will depend entirely on grain imports by 2016, a change from decades of growing all they need, due to fear of water-resource depletion. The U.S. National Intelligence Council wrote that water problems will put key North African and Middle Eastern countries at greater risk of instability and state failure and distract them from foreign policy engagements with the U.S. While they will probably not face the extreme water stress blanketing the Middle East in 2040, global superpowers such as the United States, China and India face water risks of their own. High water stress in all three countries are projected to remain roughly constant through 2040. However, specific areas of each, such as the southwestern U.S. and China’s Ningxia province, could see water stress increase by up to 40 to 70 percent. This pattern reflects a limitation of national-level datasets. 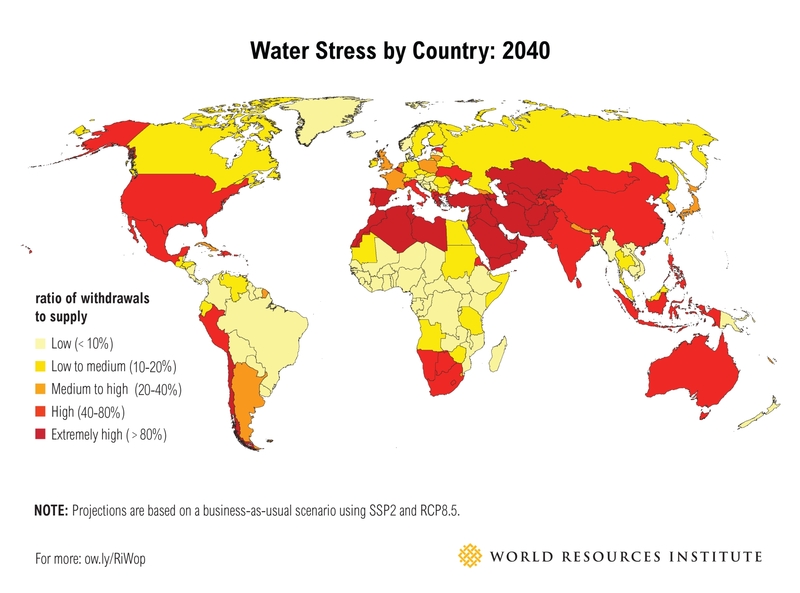 Averaging future water stress across an entire country into a single score can disguise local-level risks, even using WRI’s weighting algorithm to count water stress where water is used the most. WRI generally recommends that most Aqueduct users operate at the tool’s standard sub-river basin level with more granular information. However, certain users, such as international commercial banks with national portfolios, depend on national indicators to assess risk, so rankings and aggregated scores are valuable. Uncertainty permeates these forward-looking models because future climate conditions and development patterns are impossible to predict. Instead of focusing on a best or more likely scenario for future climate conditions, these rankings illustrate one possible future of water supply and demand. We chose this future in consultation with leading experts because it is simplified yet useful information to help international, organizations, businesses, and financial institutions take steps to mitigate risks. This set of rankings and scores can also help users more effectively adapt to a plausible future climate change and water demand scenario. Every water-stressed country is affected by a different combination of factors. 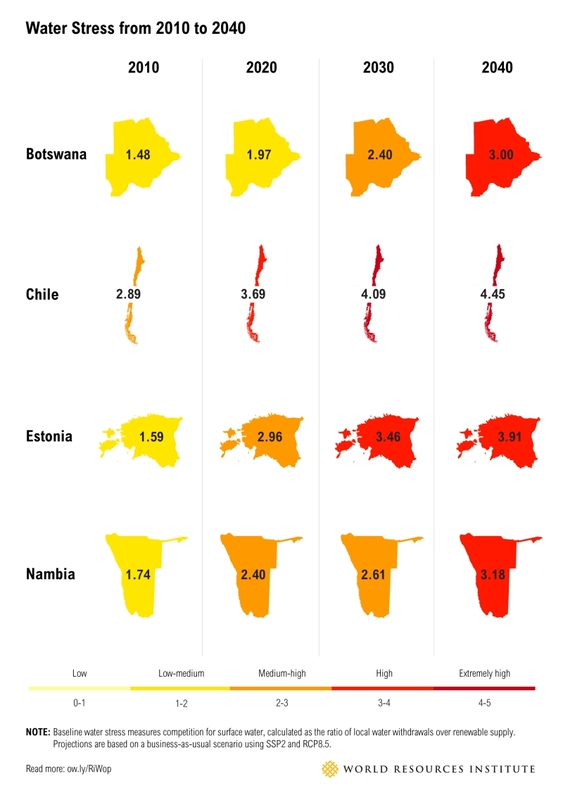 Chile, for example, projected to move from medium water stress in 2010 to extremely high stress in 2040, is among the countries more likely to face a water supply decrease from the combined effects of rising temperatures in critical regions and shifting precipitation patterns. Botswana and Namibia sit squarely within a region that is already vulnerable to climate change. Water supplies are limited, and risk from floods and droughts is high. Projected temperature increases in southern Africa are likely to exceed the global average, along with overall drying and increased rainfall variability. On the water demand side, according to Aqueduct projections, a 40 to 70 percent—or greater—increase is expected, further exacerbating the region’s concerns. Whatever the drivers, extremely high water stress creates an environment in which companies, farms and residents are highly dependent on limited amounts of water and vulnerable to the slightest change in supply. Such situations severely threaten national water security and economic growth. National and local governments must bring forward strong national climate action plans and support a strong international climate agreement in Paris this November. Governments must also respond with management and conservation practices that will help protect essential sustainable water resources for years to come. Read the technical note and explore the data set.